Do not sign for a shipment until you have thoroughly inspected for any damage or missing items. Barbeques Galore is not responsible for shipments that are not signed for as damaged or incomplete upon arrival! All grill purchases over 130 lbs. and less than 400 lbs. will have a flat $49 shipping rate. For web orders only. Valid only in the 48 contiguous United States. Drop-off/Curbside delivery only. Most items are shipped directly from our main distribution center in Southern California. On occasion, items may be shipped directly from an individual store location when that item is unavailable at our distribution center. Orders are shipped 1-2 business days after the date your order was placed. If your order includes Special Order items, the complete order will be shipped 2-4 weeks after the date your order was placed. Customers will be notified by email when their order has been shipped with tracking information. FedEx: All basic products are shipped via FedEx Ground or FedEx 2-Day shipping. Shipping times are calculated based on the date of shipment, not the order date. Freight: Grills and other heavy products are shipped via freight carrier only. The appropriate shipping options are given during checkout. Freight deliveries are curbside delivery only (white-glove services are not included). Will Call: Orders may also be picked up at Will Call at our Ontario, CA warehouse Monday through Friday. Will Call customers will be notified by email when the order is ready for pick-up; please do not come to pick up your items before this notification is sent. P.O. boxes cannot be used as shipping addresses; a physical address must be used. Shipping times are calculated based on the date of the shipment, not the date of the order. Orders are shipped 1-2 business days following the order date. FedEx does not deliver on weekends and does not count those days when factoring shipping times. Therefore, orders shipped Thursday or Friday can be expected to be delivered on Monday and Tuesday, respectively. Freight shipping depends on the customer's location. General shipping times range from 7-10 business days. The freight carrier will contact customer via the phone number provided on the order to schedule the delivery appointment. If the freight carrier cannot reach the customer in a timely manner to schedule this appointment, it will affect delivery dates. Please include a valid and readily accessible phone number with your order to avoid any unnecessary delays. If customer cannot be reached within 48 hours of first attempted contact by delivery company, the customer's order will be returned to Barbeques Galore. The customer will then be refunded the original purchase price of the order, less shipping costs and a 15% restocking fee. 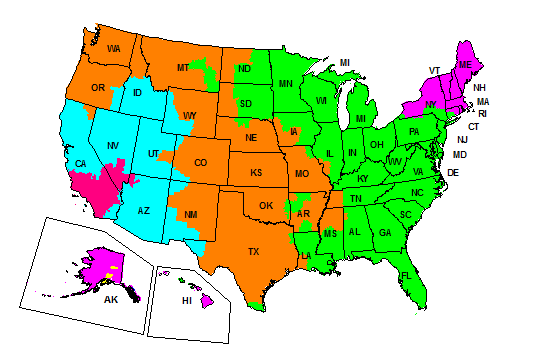 Please use the below FedEx Ground map to estimate your shipping time. ARE ASSEMBLY AND INSTALLATION SERVICES AVAILABLE? We offer assembly and installation services, but these must be arranged and paid for through a local Barbeques Galore store. We are not able to offer these services to a location further than 25 miles from a store (see a list of our stores here).